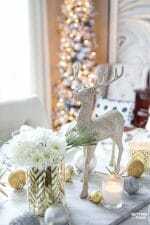 For Christmas this year I’m decorating my home with sparkly ‘Winter Woodland Glam’ style – rustic woodland pieces with a touch of shimmer and shine! The neighborhood I live in is called ‘Deer Run’ because of all the beautiful pine and cedar forests and white tailed deer that surround us. 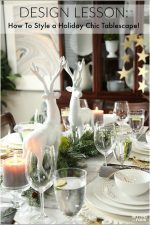 This holiday season I’m bringing the outside in by adding touches of woodland nature into my Christmas Centerpiece decor! 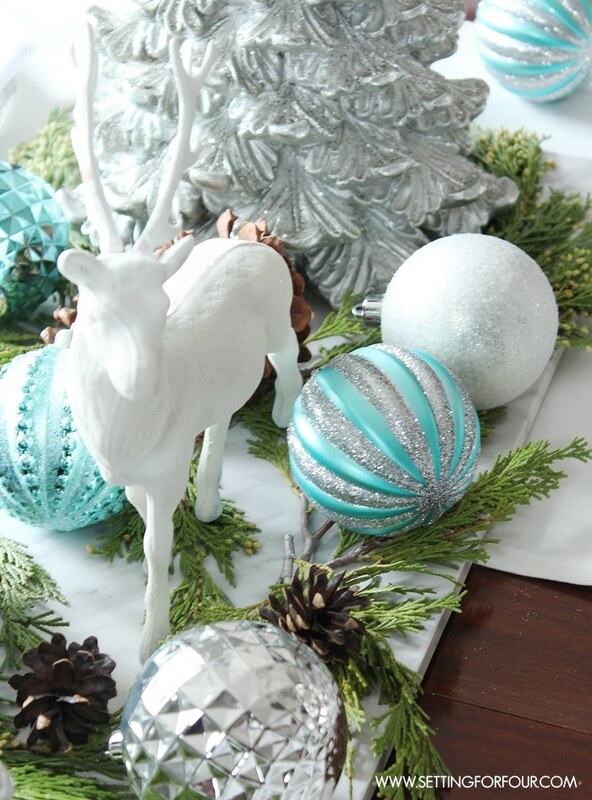 See my easy DIY decor ideas to get this Winter Woodland Glam look! 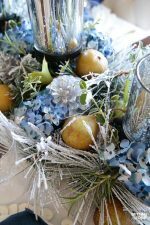 This Christmas Centerpiece is super easy to put together – it’s all about a few key ‘wow’ pieces mixed with natural woodland accents. 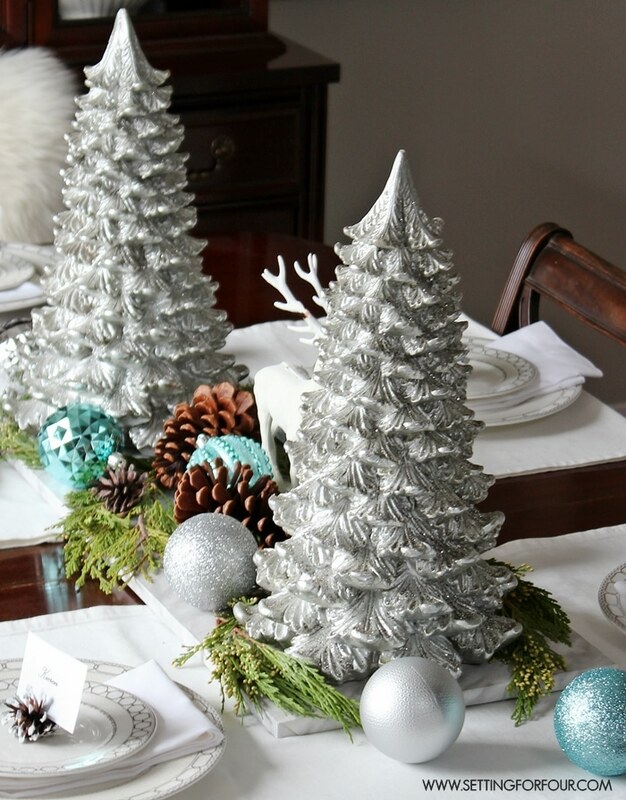 For my centerpiece I started with a marble slab and topped it with real cedar branches, pinecones and these two glam table top pine trees with champagne glitter – aren’t they gorgeous? I love this soft shimmery woodland look! I added a white deer decoration into the middle. This deer is a vintage piece that I spray painted white. He looks like he’s walking through a wooded landscape right on my table! 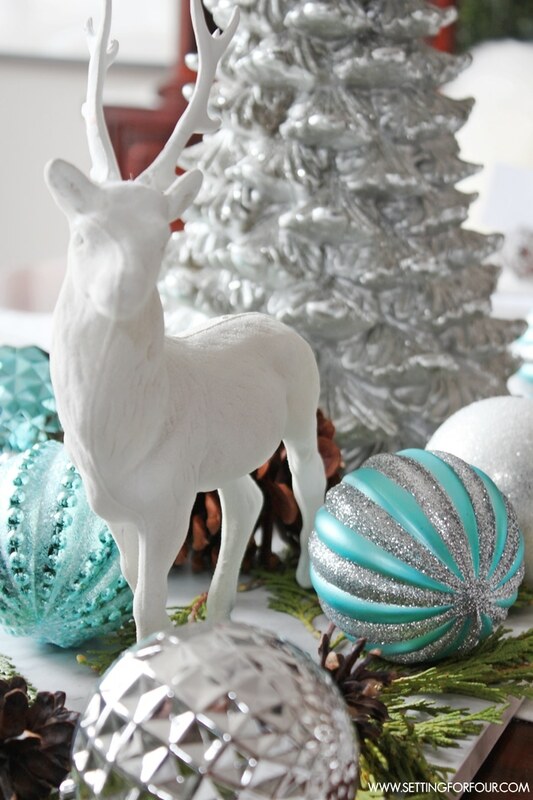 For a pop of pretty color I scattered a few of these blue, silver and white Martha Stewart Christmas ornaments here and there. 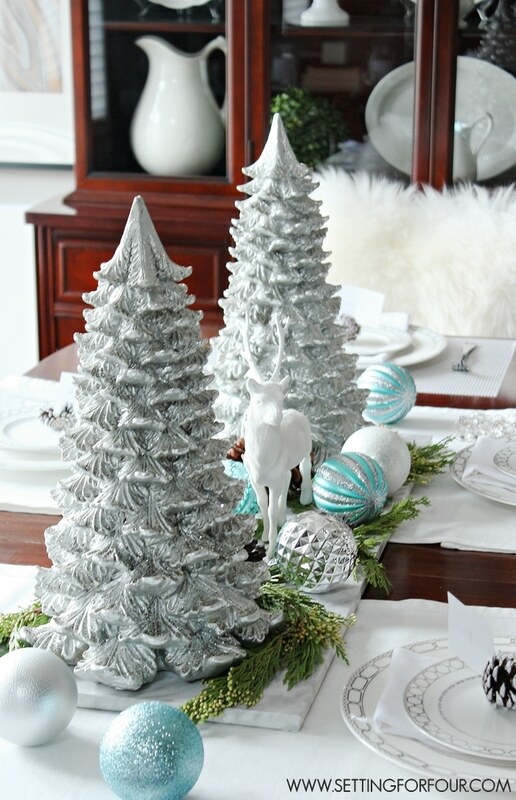 I love all the different texture and pattern of these elegant Christmas ornaments! Such an elegant combination of shiny, matte and glitter finishes in a blue, soft grey, silver and white color scheme. See how easy that was to put together? 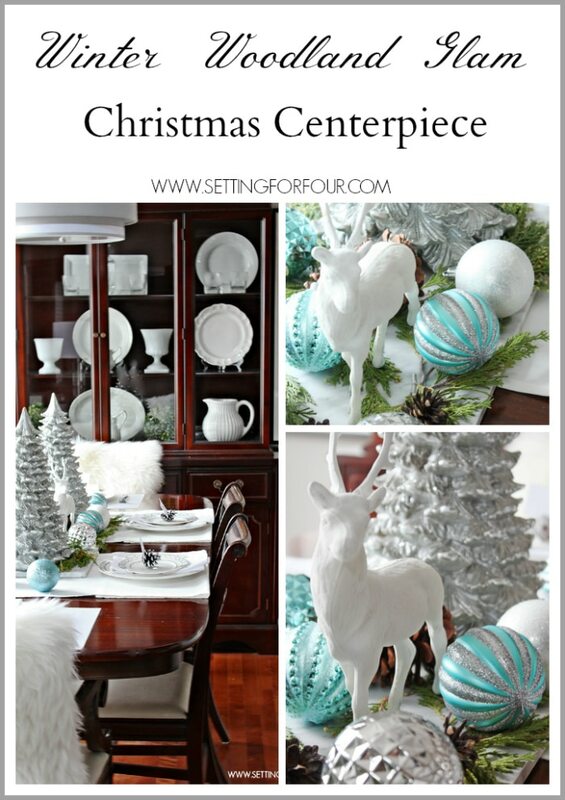 I hope you like my Winter Woodland Glam Christmas Centerpiece and decor tips! 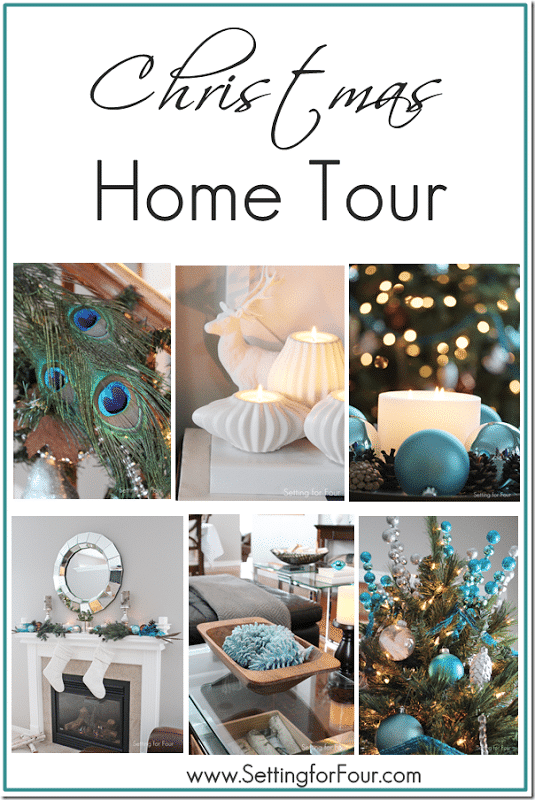 Stay tuned, I’m sharing my Christmas Entryway decor and Christmas Home tour soon! 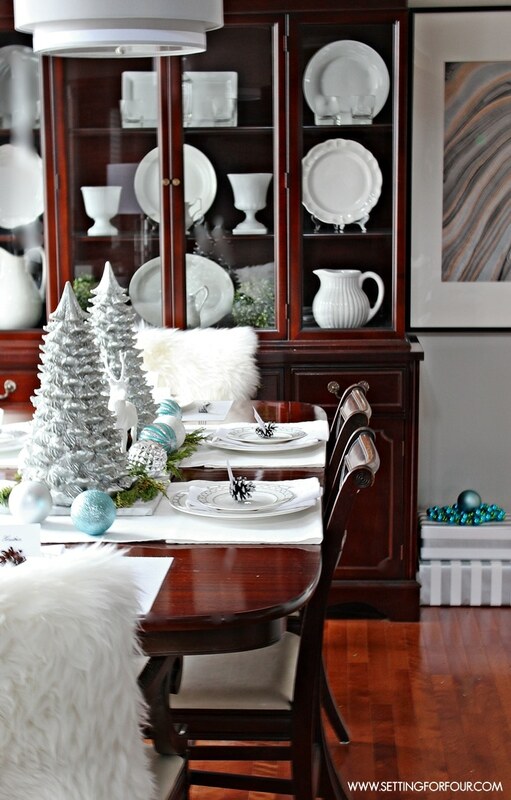 For more holiday decorating ideas see my Christmas Home Tour from last year! Its beautiful!! So fresh and bright! I have the same ornaments from MS but in gold and bronzes! 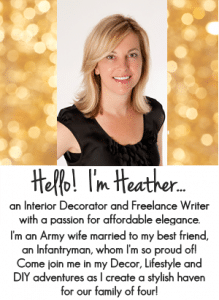 The gold and bronze is a gorgeous color combination too and so fitting in your beautiful home Heather!!! Thanks for visiting! 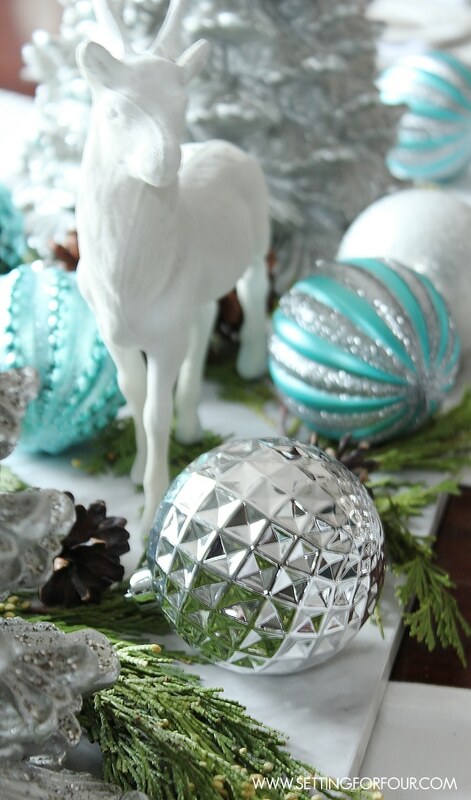 Very pretty, I really like the little pop of turquoise with all the silver and white and shimmer. 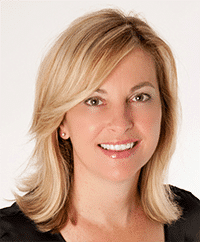 Thanks Chloe – I’m pretty much addicted to all things shimmer too! You’ve outdone yourself once again, my friend! Simply GORGEOUS!!! This is gorgeous! Love the little splashes of color! Thanks Sara – I love the splash of silver and blue too! Love white, silver, aqua, and green together. 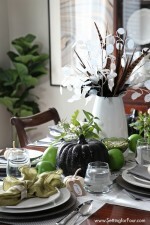 Your dining room table looks lovely! Thanks Paula – these colors are so pretty together aren’t they? Lovelt. I too love bringing the outdoors inside. The sme is amazing. 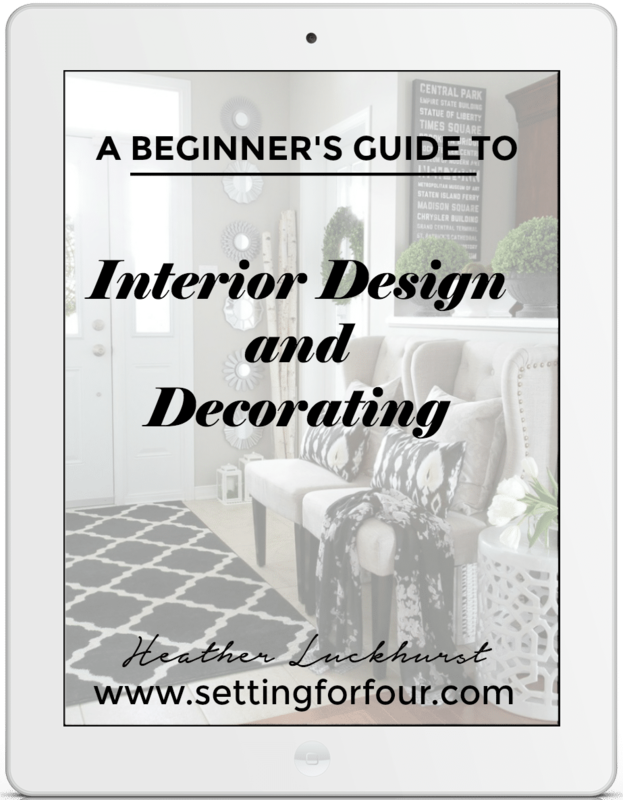 I’m totally in love with the turquoise, silver and white decor! It’s breathtaking.